I just made this salad today. I didn't have golden raisins, but dark raisins work, too. 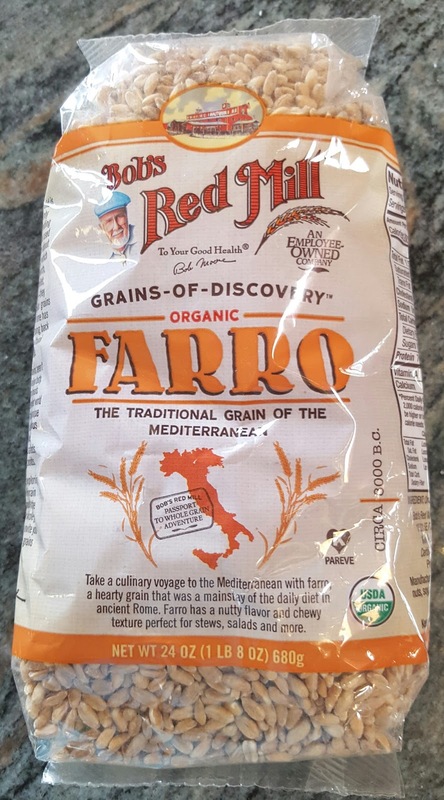 A daily staple in ancient Rome for thousands of years, Farro was also consumed throughout the Mediterranean and Middle East. It is still a popular grain and recently making a resurgence in swanky American restaurants. Farro is in the wheat family and it is believed farro may be the "mother" of all wheat. It contains lots of goodies (high fiber, protein and iron) and has a delicious nutty flavor and chewy consistency. 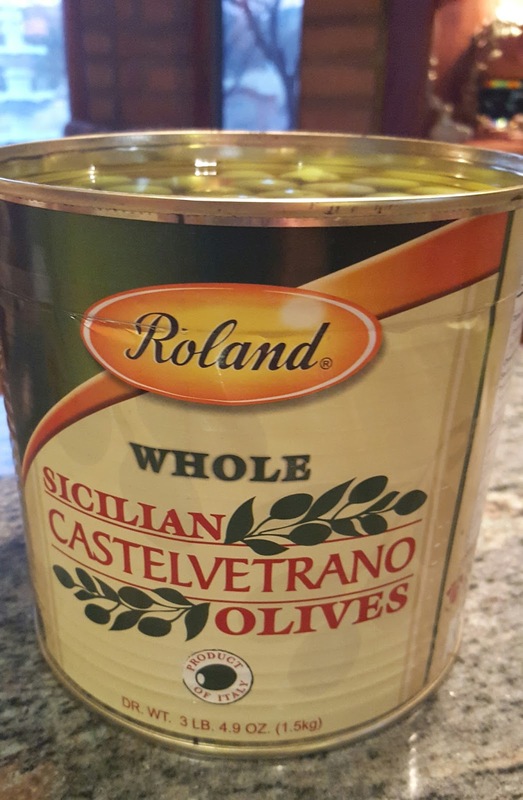 It is excellent in salads, soups, and mixed with vegetable stir-fries or other side dishes. Here's a recipe my good friend Debby V. gave me, which I love--perfect balance of salty and sweet. probably get them at Trader Joes or other similar stores. Note, the word, WHOLE. Make sure you buy them pitted! Preheat the oven to 375. (I skipped this step and lightly roasted the walnuts in a dry frying pan on top of the stove.) If using the oven, place the walnuts on a baking sheet and toast in the oven for about 15 minutes. 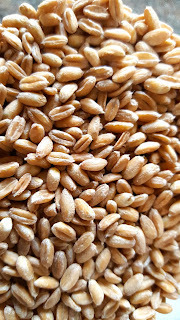 In a medium saucepan combine the farro with 4 cups of water (I used 2 cups chicken stock and 2 cups water), and 1/2 tsp. salt. 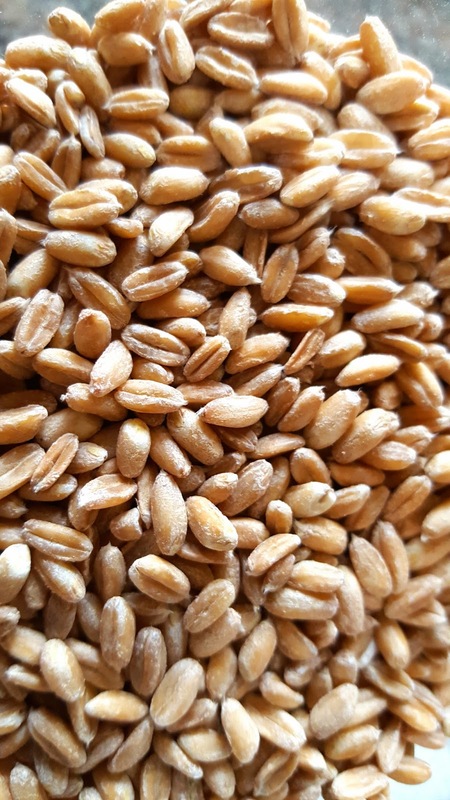 Bring to a boil and simmer, partially covered until the farro is tender, about 20-25 minutes. Drain (Save the liquid for future soup stock.) the farro and spread it on a baking sheet to cool. 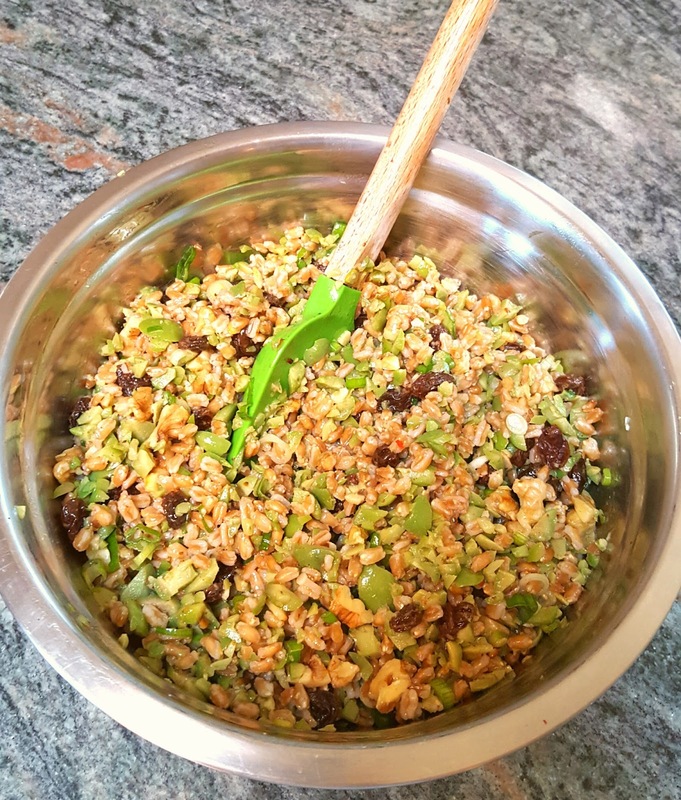 In a large bowl, combine the farro, toasted walnuts, scallions, chives, raisins, crushed red pepper, olive oil, lemon juice, honey and season with salt. Toss well. Transfer salad to a platter and garnish with the cheese. I made it the day before and I think it helped meld the flavors. 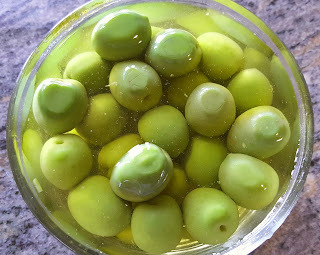 "Castelvetrano olives are Italy's most ubiquitous snack olive. Bright green, they are often referred to as dolce (sweet), and come from Castelvetrano, Sicily, from the olive variety nocerella del belice. They have a Kermit-green hue, meaty, buttery flesh, and a mild flavor." 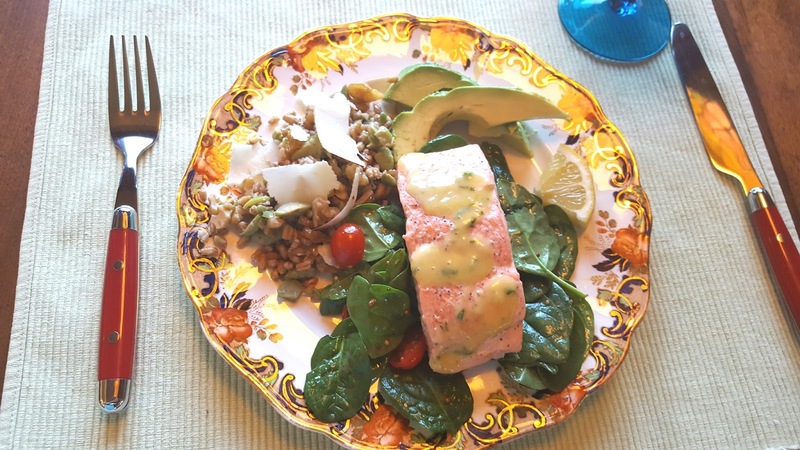 In the above recipe I used wild Coho Salmon versus a high-quality farm-raised Scottish salmon pictured below. and cherry tomatoes were the perfect complement to the Farro Salad. I dressed the greens with a citrus vinaigrette. Melt butter in a frying pan. Add stock. While stirring, bring to a gentle boil. Add lemon juice. Keep stirring. Reduce heat. Add cream. Stir some more. Season with salt/pepper. The secret to a good sauce is to bring everything together over a moderate, not high heat, and stir continuously. This sauce has endless variations: add rosemary, garlic, chives, dill, or almost any other herb you can think of! Until next time...Keep on Cooking! Rich, elegant, delicious...all describe this dessert for a very special occasion. 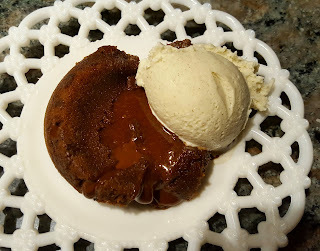 This recipe is from Paula Deen, apparently before she began her reduced sugar/low fat diet! To her credit she 'same clean' regards to her diagnosis of Type2 Diabetes. EVERYTHING IN MODERATION...that was even Julia Child's mantra about butter. So make this simple, wonderful dessert...just don't make it every day! Once you cut into this exquisite bite it is easy to see why they call it "lava" cake. It really does erupt like a volcano! Preheat oven to 425 degrees. Grease 6 (6 ounce) custard cups. 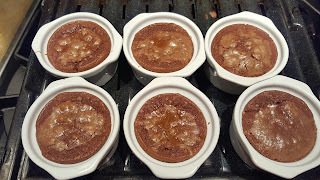 Melt the chocolates and butter in the microwave or slowly on top of the stove in a double boiler, which is what I did. Add the flour and sugar to chocolate mixture. Stir in the eggs and yolks until smooth. Stir in the vanilla and orange liqueur. Divide batter evenly among the custard cups. Place in the oven and bake for 14 minutes. The edges should be firm, but the center will be runny. Cool slightly on a rack. Run a knife around the edges to loosen and invert onto dessert plates. I made this for my husband's birthday last year. He loved it! It is so chocolatey that a little vanilla ice cream or whipped cream is the perfect complement. 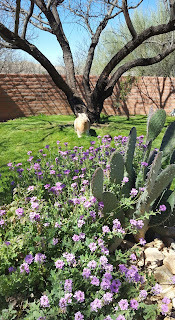 Loving our warm and sunny Arizona days and cool nights. 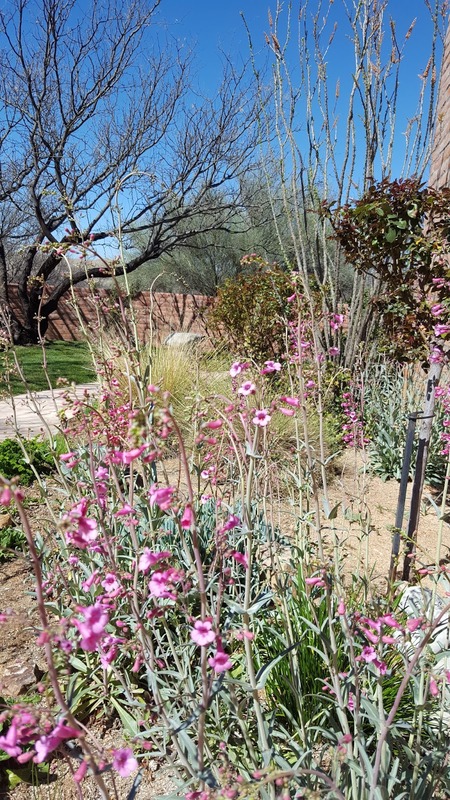 Spring flowers are beginning to bloom! 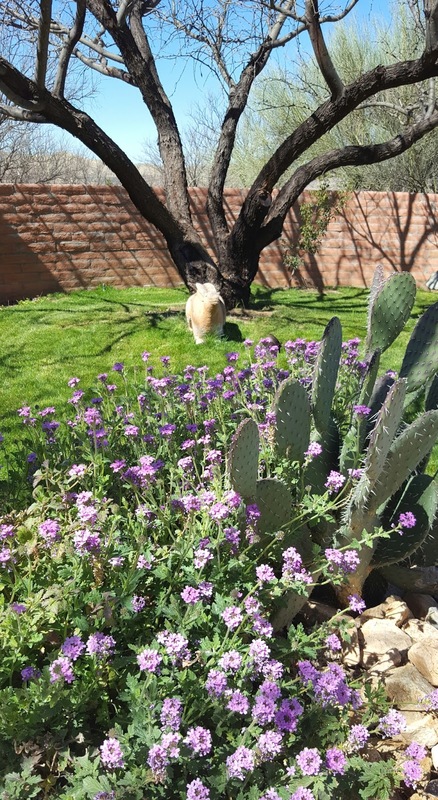 This purple verbena helped herself to our yard. The Goodding verbena variety grows wild throughout southern Arizona. 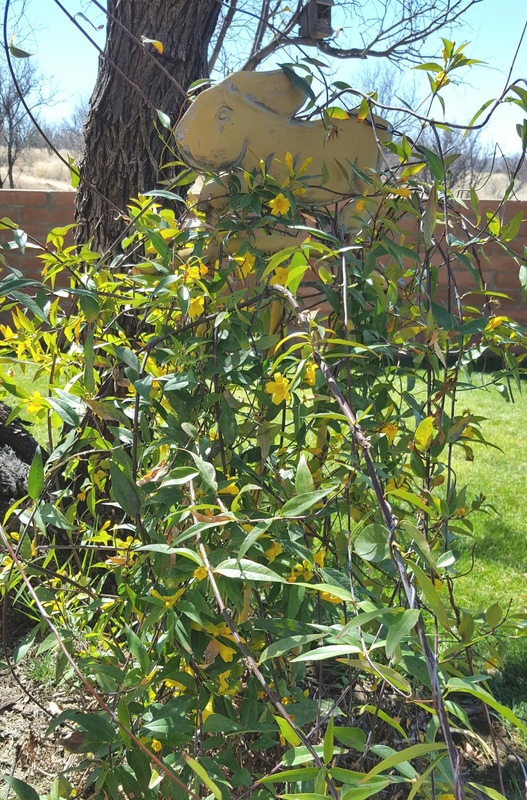 Carolina Jasmine...this one we planted! 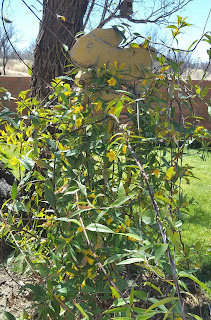 The Penstemmon also cultivated naturally. Things grow where they want to grow! 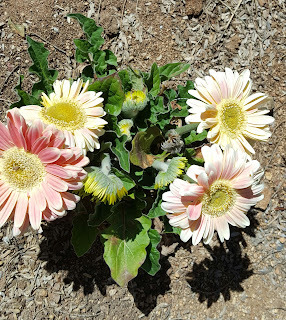 We planted the Gerbera Daisy several years ago and each spring it returns! This hearty daisy comes in shades from soft pink to brilliant orange, crimson red, and golden yellow.